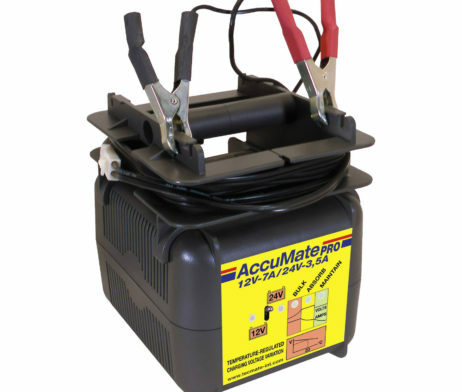 AccuMate PRO 12V-24V is a versatile automatic compact battery charger for lead-acid starter and deep cycle batteries of minimum capacity 17Ah (12V) or 9Ah (24V). 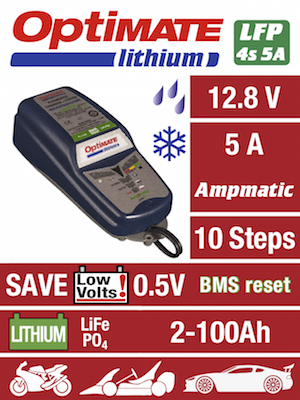 SKU: TM-202 Category: Battery Chargers Brands: Optimate. 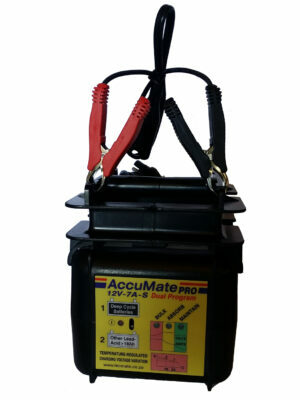 Suitable for all types of batteries: filler cap types; absorbed acid “MF” (AGM) for motorcycles; valve regulated (VRLA); & flooded (wet) & GEL-electrolyte types. 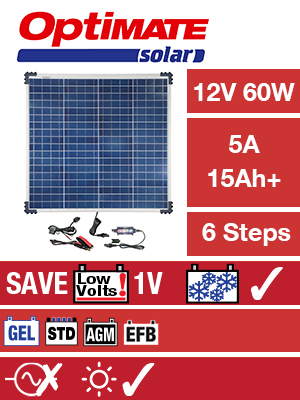 Very easy to use – Select 12V or 24V charging output according to battery type, then connect to battery and mains power. The rest is fully automatic. 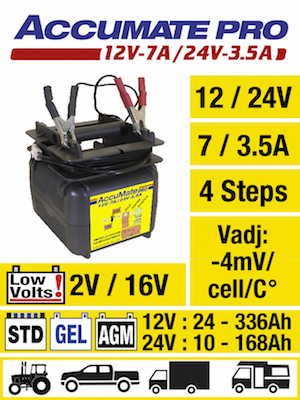 “IUoU” 3-step charging with reversion from MAINTENANCE float stage if high current is drawn during storage charging. 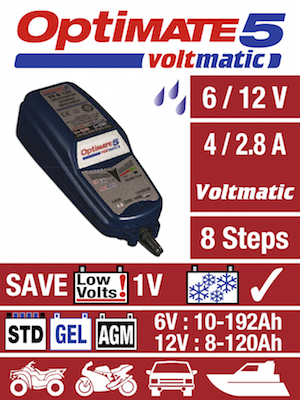 No risk of overcharging – AccuMate PRO’s special temperature regulated monitoring circuits vary & regulate the current & voltage according to ambient temperature. Integrated handle & cord winder allows for portable use. Keyhole slots on the rear for wall mounting. Detachable charge clamps are easily replaceable. 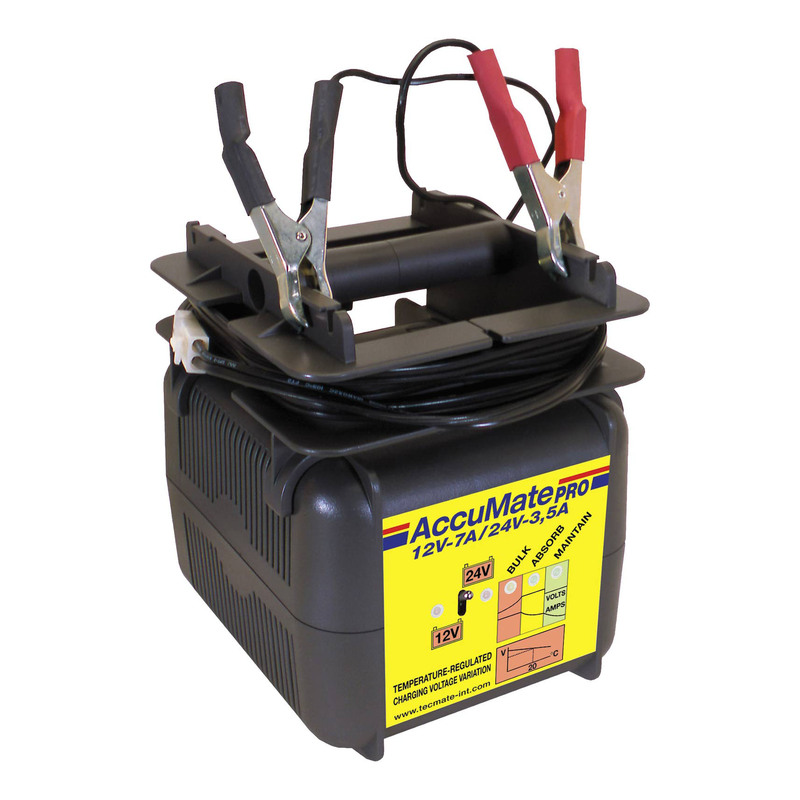 Optional charge cable extensions allow up to 15 ft/4,5m for maintaining batteries on vehicles. Integral electronic protections against short circuits at the clamps and wrong polarity connections. Spark suppression system. No fuses to blow. 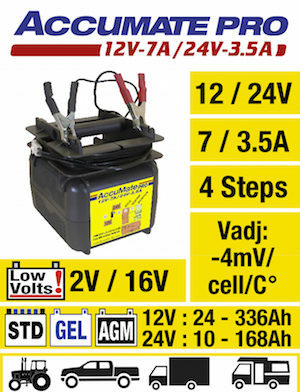 Competitively priced technology for all modern batteries.